Isn't it exciting to find a reusable version of something you've been purchasing disposable? 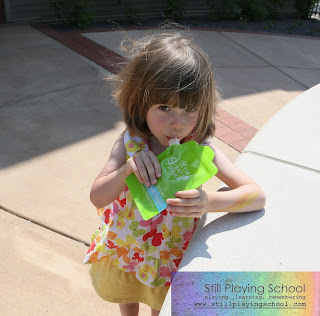 When I discovered Little Green Pouch I just knew we had to try them! This awesome mom-created company sent me a box of four - two for us to keep and two to giveaway! If you're a parent, you've likely seen the fruit and veggie puree squeeze pouches. Have you tried them? Most kids love them, just like any other squeezeable, pushable, slurpable snack. It keeps their hands and mouths busy for awhile plus they are generally mess free and super convenient to throw in a bag on your way to the playground. 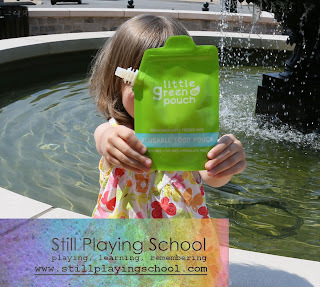 But much like Maggie, who created the Little Green Pouch, I have felt stifled by the fruit and veggie blends that were available in prepackaged pouches. I would buy a flavor to try, but E would deem it "too sour" and refuse to finish it. Since I'm filling the Little Green Pouch myself, I know that she'll like what I'm putting inside for her snack! I can add more nutritious produce that I know both kids like. I'm loving their recipe page so I'll be checking back for more ideas for both kiddos to keep the contents of our pouches new and exciting! To try it out, I unzipped the top of the dishwasher safe, BPA-free, PVC-free & phthalate-free pouch and spooned in some applesauce. I picked up E from her art camp (it was yellow/orange day as you can tell by the outfit and swath of paint on her tiny forearm) and gave her the snack at a nearby fountain. She was impressed that it was still cold! When we got home, I put the pouch on the top rack of my dishwasher, upside down and propped open. Next I filled it with a homemade pea puree for D. It was so much fun to be able to review a product that both of my kids could use! None of the accessories at the Little Green Pouch website are a necessity, but several of them would make this busy momma's life easier. I am currently most coveting these silicone spout extenders for my teething, chewing baby! For D, it is super easy to pop out a few cubes of the frozen purees I've made for him to slip into the Little Green Pouch. They thaw and keep the rest of the food in our lunch bag cold as we are out and about! Be sure to check their super informative FAQ page for anything I didn't cover in this review. 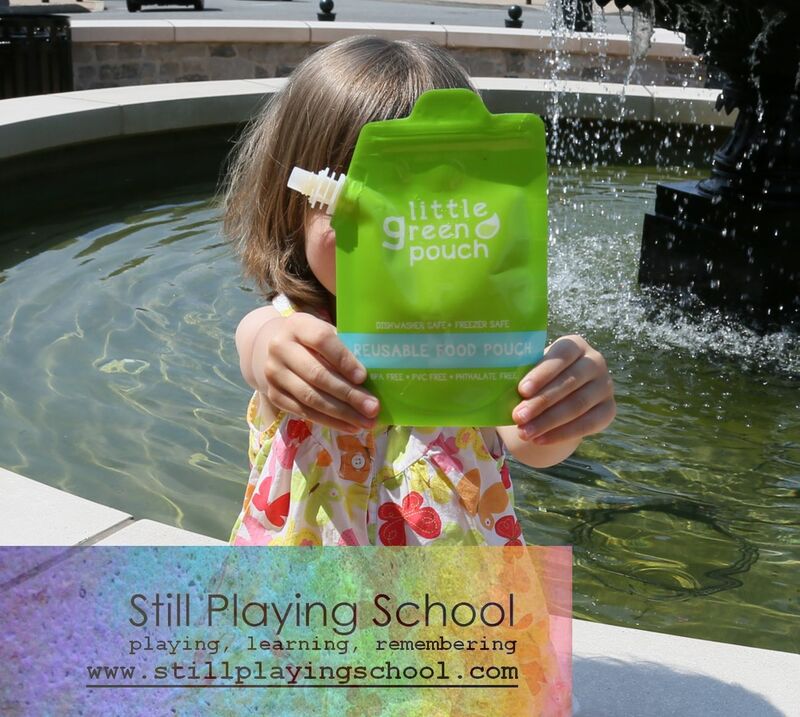 I'll report back in a few months on our SPS Facebook page to let you know how durable the pouches are after a summer of snacking on the go! Now it is your turn to try the pouches out! We will have two winners receiving one pouch each to spread the love around a bit more. Please read our Rafflecopter tutorial to make sure you know how to enter correctly! 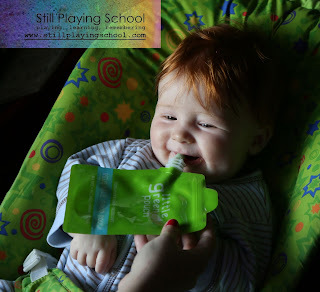 As stated above, Little Green Pouch sent our family a couple of resuable pouches in exchange for this review, but all opinions and enthusiasm is 100% our own! I was just thinking about this very thing!! Would be interesting to try this out. LilyRey wild love to start snacking on purees in this!!! This is great! and i love Julia's suggestion on your FB post :) Irelyn and Everest have tried the disposible ones my grandma got them and they loved it i think only b/c of the container. I bet these would be perfect for us to use! I had a chance to try this out with baby D the other day and I loved it! He smiled the whole time he was eating it!!! I would be using this for my 3 year old grandson who loves the store bought ones so I know he will love these even more because I can fill it with his favorite yogurt!!!! This is great!! X loves the store bought ones, but only select flavors. It would be great if I could make my own! !